We have seen many different extension names when downloading audio files. But what does they stand for and have you ever wondered why bother to buy CD when you can download music online? Are you looking for a DVD to WAV converter? Well, you are looking at the right article now. 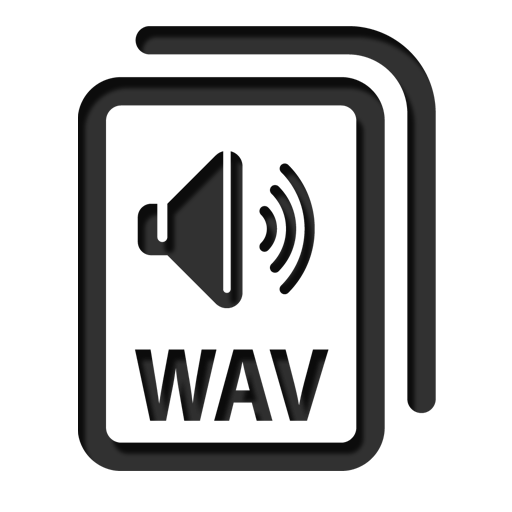 WAV is short for Waveform audio file, aka WAVE file, which is a common type of sound file. Microsoft and IBM introduced the format in 1991. It is used primarily in PCs and is identified by a file name extension of WAV (.wav). The Wave file format stores information about the file’s number of tracks (mono or stereo), sample rate, bit depth, as well as the uncompressed raw audio data. What players can be used to play WAV? WAV can be played by nearly all Windows applications that support sound, such as windows media player, iTunes, Aegisub, etc. In addition, Leawo Free Blu-ray Player can be employed as a WAV media player. Why do people convert DVD to WAV but not MP3? The good thing about WAV file is that it could digitize sounds without audio quality loss. While its drawback is the file size. When it comes to music file, a WAV file can be way bigger than a MP3 file. However, the smaller file size means quality loss. Thus, music lovers still choose to store files in WAV for good sound quality. 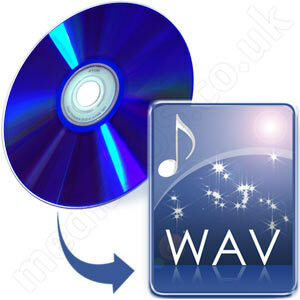 In addition, you can also use WAV to create other types of audio files, such as MP3. Now let’s get into the step-by-step guide of how to rip DVD to wav. There are two user-friendly DVD to WAV converters I would like to recommend. Leawo DVD Ripper is a handy DVD to WAV converter on Windows platforms, and Mac users can switch to its Mac counterpart- Leawo DVD Ripper for Mac. It has a fast conversion speed and excellent output quality. It can rip DVD to video in any format for portable media players and can also convert DVD to audio file, such as DVD to MP3, M4A, WAV, WMA, AC3, MP2, etc. Download and install Leawo DVD Ripper on your computer, and kick off the progam after the installation completes to get ready for WAV audio extraction from DVD. First, insert the DVD disc into the DVD drive, click “DVD Ripper” icon on the home page or “Convert” module at the top to enter DVD ripping interface and import the DVD files by clicking the “Add Blu-ray/DVD” button. After which you could select subtitles and audio tracks, play back loaded DVD movie, adjust conversion order, etc. Second, click the drop-down box (named “MP4 Video” by default) next to the “Add Photo” button and then select “Change” option to set output format. And then select “WAV Audio” under the “Common Audio” column under “Format”. Now you will see the file format is changed into WAV Audio. Third, click the green Convert button to choose outputting location and then click the Convert button down below. And there it is: you just converted a video into WAV audio. Leawo Music Recorder provides the easiest and safest way to record music and audio from computer audio and online music sources like YouTube, AOL Music, Last.fm, etc. 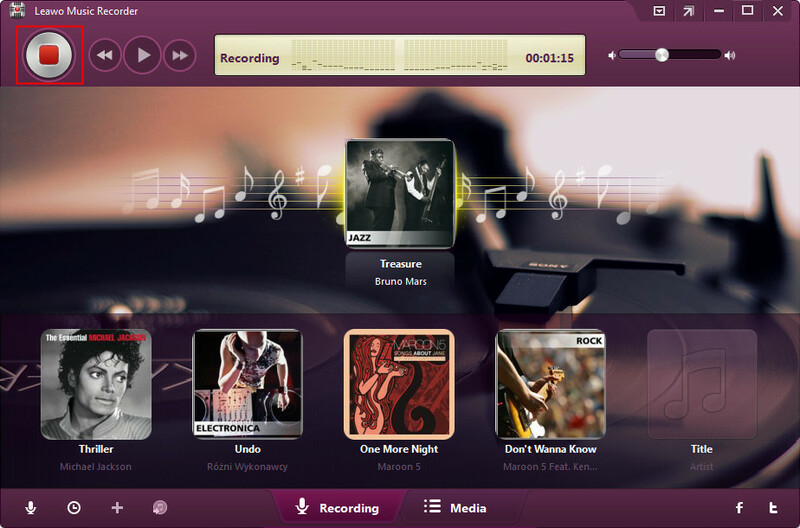 It enables music lovers to record music and audio from both computer audio and input audio. It can automatically add song album cover and other song tags like artist and song name; automatically split/filter songs upon preset time duration; manage recorded music files and edit recording files freely; apply recorded music or audio files to iTunes in one click. Download and install Leawo Music Recorder on your comupter before you start to record DVD audio and save as WAV audio format. 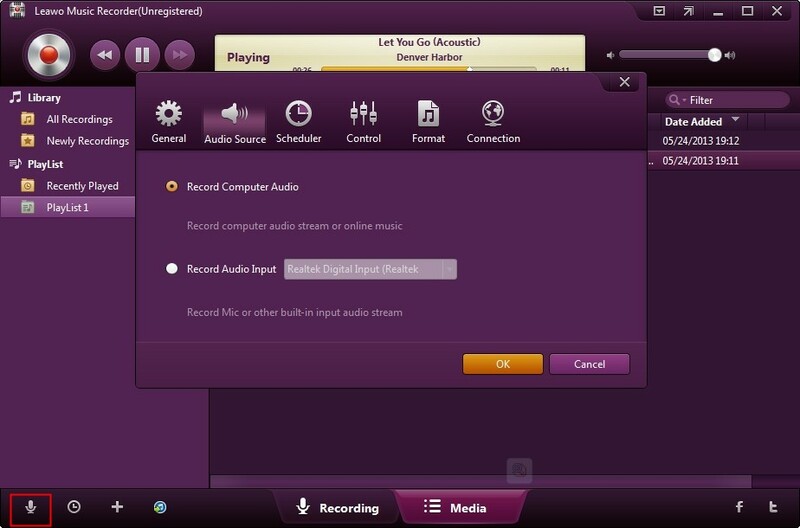 First, run Leawo Music Recorder to enter the elegant purple-looking operating interface on which you need to click the “microphone icon” to choose audio source and click “OK” after selecting “Record Computer Audio”. Second, set the output format to WAV Audio under the column of “Format” by clicking the “microphone icon” and click “OK” button afterwards. Third, click the set “microphone icon” again and choose the outputting location by clicking column “General” at the very left to choose outputting location. Click “OK” to close it. Fourth, insert your DVD disc into DVD drive and start playing it after you click the red recording button. Click the red record button again to end recording and you’ll see your recording at the track down below. Fifth, play it to check the recording quality. The track will be saved after recording finishes. Finally, go to column “Media” at the bottom where you can find a playlist of recordings. 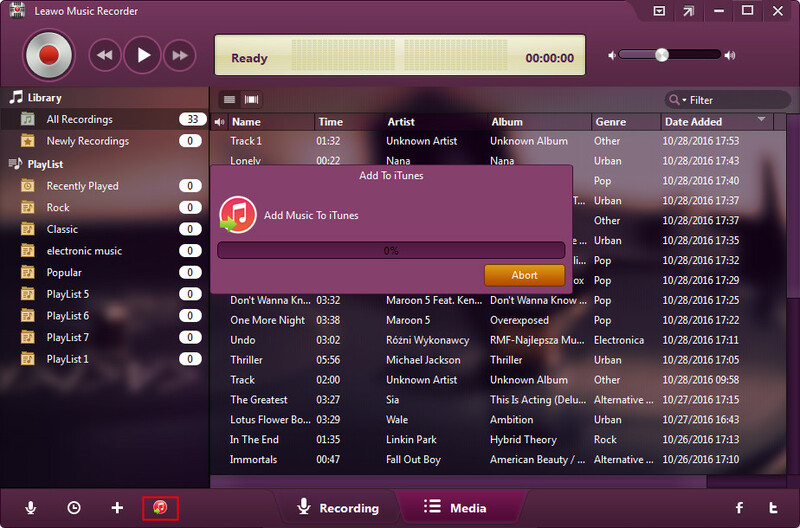 You will also find a red iTunes button that enables you to add recording files to iTunes. A simple click will do the magic. You can convert movies, videos, music to high quality wav audios by using the above-mentioned DVD to WAV converters. Both of them are very handy. And I hope you have a pleasant converting journey.